It’s a spectacular course rich in natural beauty, lush vegetation, and exotic tropical wildlife. Over 150 birds, 150 trees, and 100 animals have been identified living in the densely vegetated area surrounding the golf course at Los Sueños. A variety of native monkeys, tucans, iguanas, and pilots can often be seen on various holes around the course. 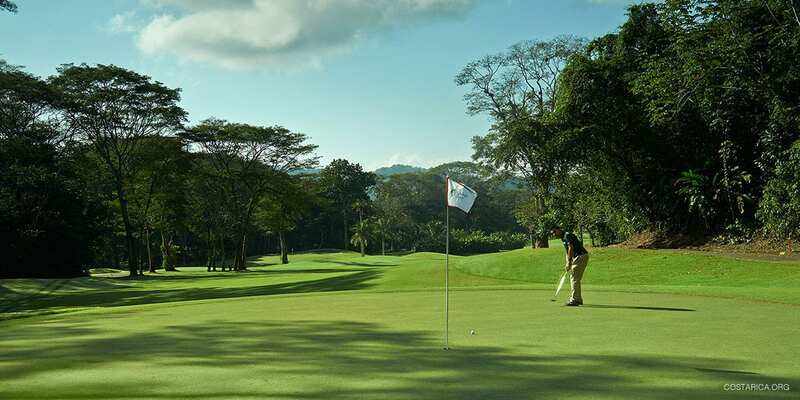 Bordered by ocean and rainforest, a dense canopy of exotic plants, rainforest trees, and wildlife, the Los Suenos Beach & Golf Resort is one truly one of the golf’s most picturesque settings. Recently opened in 1999, Los Sueños Golf Course was designed by Ted Robinson with two things in mind, challenging golf and natural beauty. Playing here at Los Sueños is an ecological experience as well as a great day of golf. A beautiful two-hour ride from San Jose through the scenic mountains of Costa Rica’s Central Valley takes you to The Marriott’s Los Sueños Beach & Golf Resort. Situated on a secluded cove of the Pacific Ocean, Los Sueños is surrounded by lush rainforest. This resort offers beautiful views of the Costa Rica’s Pacific coastline and is one of the very finest in the entire country. The Area that Los Sueños is located in is absolutely stunning. Playa Herradura gives you stunning views of the Pacific Ocean perfect for that game changing moment. The Central Pacific has some great things to do in the Area. After a couple days of golf, it might be nice to try out some small day excursions. Go visit the Manuel Antonio National Park or even try out a luxury catamaran tour on the Marlin del Rey.